On-going posts on anything relating to Boba Fett (actors, fans, exclusives) at the Celebration 4, going on right now. PHOTO - "The Vader Project"
LA Weekly - "From the Star Wars Celebration IV, 66 artists designed their own Darth Vader helmets -- [Artist] Suckadelic standing in front of his own Vader project. ... [He was] in a Boba Fett costume (which he was also wearing in real life, wandering around the convention center) holding a mini model boombox." Exhibit curated by Dov Kelemer. ARTICLE - "L.A. expo is not far, far away"
Press-Telegram - "Everyone likes to kick it with Jango." INTERVIEW - "Steve Sansweet: The Sweet Sounds of a Star Wars Obsession"
CNBC - "This is a pretty exact replica of the bounty hunter Boba-Fett," he says, standing next to the hulking figure of the high-tech assassin. Flickr user jorge_pina2002 - "These guys guide you on creating a Boba or Jango Fett outfit." Flickr user Official Star Wars Blog - "An actual working rocket-pack Boba Fett makes a surprise landing at the Opening Ceremonies." PHOTO - "Pair of Fetts"
Flickr user Official Star Wars Blog - "Like father, like son. A pair of Fetts, and not the usual pair, either." 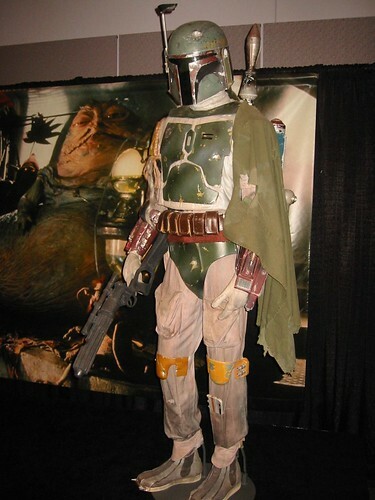 Flickr user Official Star Wars Blog - "From the Lucasfilm Archive Exhibit: An original Boba Fett costume, part of a Jabba's Palace-themed display." PHOTO - "Boba Fett" in box / "He's No Good to Me Dead"
Flickr user Official Star Wars Blog - "How do you think that armor got scuffed in the first place? Not enough bubble wrap." The backpack thing was very cool. I can only get the "angle B" video to work, though. Must have been really loud, though. I noticed alot of people in the crowd holding their ears. Still, very nicely done. They pulled out the stops on this one, didn't they?